The psychotropic effects of Cannabis, primarily due to the main psychotropic cannabinoid, Δ9-THC (delta9-tetrahydrocannabinol), have been intensely studied as pure compounds for medicinal activity. The pharmaceutical industry, however, is interested in the plant as a source of raw material and studying the variability and synergy among the various secondary metabolites. Other cannabinoids, terpenoids, and flavonoids may reduce Δ9-THC-induced anxiety, cholinergic deficit, and immunosuppression, while at the same time increase cerebral blood flow, enhance cortical activity, kill respiratory pathogens, and provide anti-inflammatory activity (McPartland and Russo, 2001). Terpenoids possess a broad range of biological properties, including cancer chemo preventive effects, skin penetration enhancement, antimicrobial, antifungal, antiviral, anti-hyperglycemic, anti-inflammatory, and antiparasitic activities (Paduch et al., 2007). Plants exhibit dynamic biochemical changes when attacked by diseases and herbivores and in response to abiotic stresses, resulting in the induced production and release of aroma volatiles that are beneficial for direct or indirect defense. In Arabidopsis thaliana (Huang et al., 2010) and in Medicago truncatula (Navia-Ginè et al., 2009) a significant quantitative variation in the emission of the monoterpene trans-β-ocimene occurs as a consequence of the attack by herbivorous insects. Two monoterpenes generally present in the aroma volatiles of Cannabis, limonene and α-pinene, as well as other monoterpenes, have been shown to powerfully repel herbivorous insects (Nerio et al., 2010), while sesquiterpenes tend to be related to intake by grazing animals. Potter (2009) demonstrated that in Cannabis the monoterpene:sesquiterpene ratios in leaves and inflorescences are very different because of the dominant presence of sessile trichomes on foliage and of capitate stalked trichomes on floral material, with the most volatile monoterpenes dominating in inflorescences to repel insects and the most bitter sesquiterpenes dominating in leaves to act as antiherbivory for grazing animals. Being that pharmaceutical Cannabis is normally cultivated in facilities not accessible to grazing animals, the major pest problem remains herbivorous insects, especially the most common and destructive spider mites, thrips, and whiteflies, thus the analysis of monoterpenes and the study of their variability may play a strategic role into select plants less susceptible to the attack of these and other insects. Terpenes are strongly inherited and little influenced by environmental factors and, therefore, have been widely used as biochemical marker in chemosystematic studies to characterize plant species, provenances, clones and hybrids. A wide variability in terpenoids content in different strains of Cannabis have been reported (Mediavilla and Steinemann, 1997; Novak et al., 2001; Hillig, 2004; Fischedick et al., 2010). The variability on secondary metabolism combined with genetic data has recently re-opened the old debate on its taxonomic treatment. In fact, Hillig (2005) proposed a polytypic concept which recognizes three species (Cannabis sativa, Cannabis indica and Cannabis ruderalis) and seven putative taxa, but at present the majority of researchers continue to agree on the monotypic treatment and identify the species as Cannabis sativa L. The differentiation of strains in ‘pure sativa’, ‘mostly sativa’, ‘sativa/indica hybrid’, ‘mostly indica’, ‘pure indica’ and ‘ruderalis hybrid’ is generally adopted by breeders and growers to distinguish the different biotypes. The current study investigated the variability in terpene profiles of Cannabis strains and explored the utility of monoterpenes in the distinction between ‘mostly sativa’ and ‘mostly indica’ biotypes. Several strains with Δ9-THC profile were obtained from breeders of private companies. Assignment of strains exclusively to ‘mostly sativa’ or ‘mostly indica’ biotypes was based on the genetic background declared by breeders of the strains. Assignment to ‘pure indica’ and ‘pure sativa’ biotypes was not used because of the uncertain information on these strains. Each strain consisted of a commercial pocket, generally of ten viable seeds. Preliminary evaluations on the declared genetic background were performed by growing these strains during the spring-summer term in a greenhouse at CRA-CIN (Rovigo). At the beginning of the flowering stage staminate plants were eliminated while pistillate plants were treated with silver thiosulfate solution to artificially induce the production of staminate inflorescences. Self-pollination of all the pistillate plants was performed by physically isolating plants from each other by individual white paper bags. Only 16 pistillate plants derived from 16 different strains were finally selected. 8 plants (ID: 5, 6, 7, 8, 9, 10, 11 and 12) were derived from ‘mostly sativa’ strains and the other 8 plants (ID: 2, 3, 4, 13, 14, 15, 16 and 17) were derived from ‘mostly indica’ strains. Progenies of the 16 plants were grown in indoor conditions at CRA-CIN (Rovigo). In total 99 plants (3 to 7 plants for each strain) were grown under 600 W/m2 high pressure sodium lamps (Philips Son-T). Photoperiod was kept at 18 hours of light for the first 4 weeks of cultivation and then decreased to 12 hours of light until the harvest. Temperature and relative humidity of the air were respectively maintained at 25±3°C and 50-70%. Plants were individually grown in 1.5-L pots in finely ground flakes of coconut fibre (CANNA B.V.) and they were daily ferti-irrigated, by using an automatic irrigation system, with a dose of nutrient solution depending on requirement. The nutrient solution used (EC=1.7) was obtained by mixing equal parts of Coco A and B (CANNA B.V.) with tap water, and then the pH level was adjusted to 5.5. Ferti-irrigation was interrupted 2 weeks before the harvest and pots were flushed with tap water adjusted to pH=5.5. The harvest of early strains (‘mostly indica’) occurred after 105 days from sowing while the harvest of late strains (‘mostly sativa’) was deferred at 133 days. Fresh inflorescence tissues of plants were sampled during the harvest for analyses of terpenoids. The sample material (80 mg of fresh inflorescence tissues) was ground in liquid nitrogen, extracted in 4 ml of n-pentane and then 1 ml of the extract was transferred to GC vials. The terpene composition was analyzed by GC/FID. In total, 28 compounds were detected, 15 were fully identified while 13 remained unknown (unk). Terpenoids were identified by matching their retention times with those of pure compounds under the same conditions. 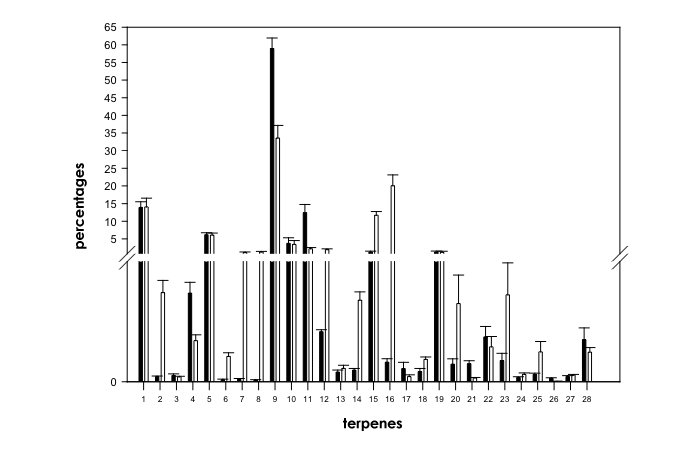 Depending from their retention times, peaks were identified as following: α-pinene, unk1, unk2, camphene, β-pinene, sabinene, Δ-3-carene, α-phellandrene, β-myrcene, α-terpinene, limonene, 1.8 cineole, γ-terpinene, cis-β-ocimene, trans-β-ocimene, α-terpinolene, unk3, unk4, β-caryophyllene, unk5, unk6, unk7, unk8, unk9, unk10, unk11, unk12 and unk13. Terpenoids identified were mostly monoterpenes with the exception of one sesquiterpene, β-caryophyllene. Relative content of each monoterpene was expressed as a percentage of total monoterpenes, while each sesquiterpene was calculated as a percentage of total mono terpenes plus sesquiterpenes. Data were not normally distributed Kolmogorov-Smirnov One-Sample Test and were analysed by the non-parametric Kruskal-Wallis ANOVA followed by the Mann-Whitney U Test for multiple comparisons. Differences were accepted as significant at the 5% level. Statistical analyses were performed by using SYSTAT 12.0 software (Systat Software Inc., USA). The relative content of terpenoids is strongly inherited while total yield per weight of tissue is more subjected to environmental factors. Expression of composition on a tissue basis (mg/g) is used for quality control and standardization of Cannabis cultivars, as well as for chemosystematic studies (Fischedick et al., 2010), but the relative content (%) of terpenoids is more often used for chemosystematic studies. The average relative contents of dominant compounds detected in the aroma volatiles of all the strains were: β-myrcene (46.1±2.6%), α-pinene (14.0±1.5%), α-terpinolene (10.2±1.8%), limonene (7.3±1.3%), trans-β-ocimene (6.6±0.7%), β-pinene (6.1±0.4%), α-terpinene (3.6±1.0%), β-caryophyllene (1.2±0.2%), 1.8 cineole (1.1±0.2%), α-phellandrene (0.7±0.1%) and Δ-3-carene (0.6±0.1%). 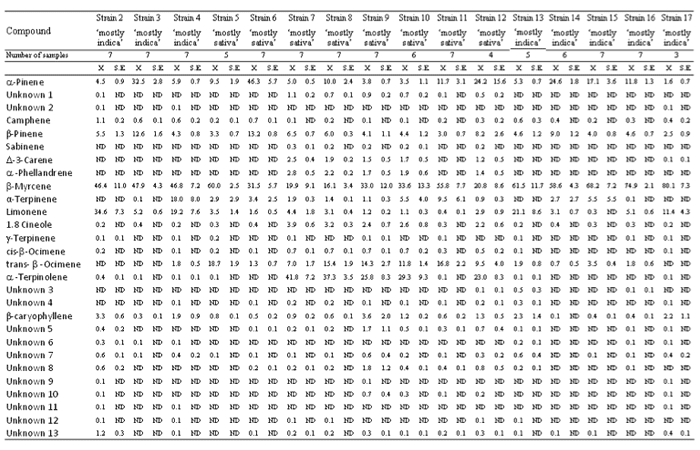 The average relative contents of camphene, unk1, cis-β-ocimene, unk5, unk8, unk7, unk13, sabinene, γ-terpinene, unk3, unk4, unk6, unk10, unk2, unk9, unk11 and unk12 were lower than 0.5%. Results of Kruskal-Wallis ANOVA between different strains (d.f.=15, N=99) showed significant changes in relative contents of all the compounds: α-pinene (X2=71.6, P<0.001), unk1 (X2=71.5, P<0.001), unk2 (X2=43.6, P<0.001), camphene (X2=67.2, P<0.001), β-pinene (X2=53.2, P<0.001), sabinene (X2=72.5, P<0.001), Δ-3-carene (X2=69.4, P<0.001), α-phellandrene (X2=59.6, P<0.001), β-myrcene (X2=47.7, P<0.001), α-terpinene (X2=36.3, P<0.01), limonene (X2=77.1, P<0.001), 1.8 cineole (X2=67.5, P<0.001), γ-terpinene (X2=30.9, P<0.01), cis-β-ocimene (X2=79.5, P<0.001), trans-β- ocimene (X2=82.1, P<0.001), α-terpinolene (X2=78.7, P<0.001), unk3 (X2=37.6, P<0.001), unk4 (X2=33.7, P<0.01), β-caryophyllene (X2=55.7, P<0.001), unk5 (X2=65.6, P<0.001), unk6 (X2=74.4, P<0.001), unk7 (X2=50.1, P<0.001), unk8 (X2=64.7, P<0.001), unk9 (X2=63.2, P<0.001), unk10 (X2=61.1, P<0.001), unk11 (X2=80.1, P<0.001), unk12 (X2=61.8, P<0.001) and unk13 (X2=52.8, P<0.001). β-myrcene was detected in high % in all the strains, with strain 17 having the highest relative content (80.1±7.3%) and strain 8 having the lowest relative content (16.1±3.4%) (Table 1). β-myrcene was the dominant terpene in almost all the strains, with the exceptions of strains 6, 7, 8 and 12. α-terpinolene was detected in high % in some ‘mostly sativa’ strains (7, 8, 9, 10 and 12), with strains 7 and 8 having α-terpinolene as the dominant terpene (respectively 41.8±7.2% and 37.3±3.5%), while it was not detected or it was detected in traces in ‘mostly indica’ strains and in some ‘mostly sativa’ strains (5, 6 and 11). α-pinene and β-pinene were detected in all the strains and their relative contents were commonly lower than 10%. α-pinene was detected in higher relative contents (up to 10%) in some strains (3, 6, 8, 11, 12, 14, 15 and 16), with strains 6 and 12 having α- pinene as the dominant terpene (respectively 46.3±5.7% and 24.2±15.6%). β-pinene was detected in higher relative contents (up to 10%) in strains 3 (12.6±1.6%) and 6 (13.2±0.8%). Limonene was detected in low % or traces in some ‘mostly indica’ strains (3, 14, 15 and 16) and in ‘mostly sativa’ strains, while it was detected in much higher % (up to 10%) in some ‘mostly indica’ strains (2, 4, 13 and 17), with these strains having limonene as second most abundant terpenoid. Trans-β-ocimene was not detected or it was detected in low % in one ‘mostly sativa’ strains (6) and in ‘mostly indica’ strains, while in some ‘mostly sativa’ strains (5, 7, 8, 9, 10, 11 and 12) it was detected in much higher % (up to 5%), with strains 5 and 11 having trans-β-ocimene as second most abundant terpenoid (respectively 18.7±1.9% and 16.8±2.2%). α-terpinene was detected in low % or traces in almost all the strains, with strain 4 having a much higher relative content (18.0±8.0%). The sesquiterpene β-caryophyllene was detected in all the strains and its relative content was commonly lower than 2%, with some strains (2, 9, 13 and 17) having relative contents up to 2%. 1.8 cineole was detected in low % (up to 2%) in some ‘mostly sativa’ strains (7, 8, 9, 10 and 12), while it was detected in lower % or traces in ‘mostly indica’ strains and in some ‘mostly sativa’ strains (5, 6 and 11). Δ-3-carene and α-phellandrene were detected in low % (up to 1%) in some ‘mostly sativa’ strains (7, 8, 9, 10 and 12), while they were not detected in ‘mostly indica’ strains and in some ‘mostly sativa’ strains (5, 6 and 11). Mann-Whitney U test between ‘mostly sativa’ strains and ‘mostly indica’ strains (d.f.=1, N=99) showed significant changes in relative contents of several compounds except for α-pinene, unk2, β-pinene, α-terpinene, γ-terpinene, β-caryophyllene, unk7, unk12 and unk13 (Fig. 1). Relative contents of camphene (X2=22.7, P<0.001), β-myrcene (X2=23.1, P<0.001), limonene (X2=27.8, P<0.001), unk3 (X2=15.4, P<0.001), unk6 (X2=29.9, P<0.001) and unk11 (X2=42.3, P<0.001) were significantly higher in ‘mostly indica’ strains than in ‘mostly sativa’ strains (Fig. 1). Plants derived from ‘mostly sativa’ strains showed significantly higher relative proportions of unk1 (X2=33.4, P<0.001), sabinene (X2=24.9, P<0.001), Δ-3-carene (X2=39.6, P<0.001), α-phellandrene (X2=31.97, P<0.001), 1.8 cineole (X2=19.2, P<0.001), cis-β-ocimene (X2=48.6, P<0.001), trans-β- ocimene (X2=52.6, P<0.001), α-terpinolene (X2=13.2, P<0.001), unk4 (X2=15.3, P<0.001), unk5 (X2=29.6, P<0.001), unk8 (X2=24.3, P<0.001), unk9 (X2=7.5, P<0.01) and unk10 (X2=9.5, P<0.01) than plants derived from ‘mostly indica’ strains (Fig. 1). Although Hillig (2004) stated that differences on terpenoids in Cannabis are of limited use for taxonomic discrimination at the species level, with sesquiterpenes generally more useful than monoterpenes, we found that several monoterpenes markers can be powerful tools for discerning between ‘mostly sativa’ and ‘mostly indica’ biotypes (Table 1 and Fig. 1). Our results are also supported by results recently obtained by Fischedick et al. (2010) showing that monoterpenes are able to distinguish cultivars with similar sesquiterpenes and cannabinoids levels. Table 1. Terpene profiles of different ‘mostly indica’ and ‘mostly sativa’ strains of Cannabis sativa L.
Fig. 1. Comparison of terpene profiles in ‘mostly indica’ (black histograms) and in ‘mostly sativa’ (white histograms) strains of Cannabis sativa L. Break on Y-axis is 0.7-0.8. Numbers on X-axis refer to individual compounds: 1=α-pinene, 2=unk1, 3=unk2, 4=camphene, 5=β-pinene, 6=sabinene, 7=Δ-3-carene, 8=α-phellandrene, 9=β-myrcene, 10=α-terpinene, 11=limonene, 12=1.8 cineole, 13=γ-terpinene, 14=cis-β-ocimene, 15=trans-β-ocimene, 16=α-terpinolene, 17=unk3, 18=unk4, 19=β-caryophyllene, 20=unk5, 21=unk6, 22=unk7, 23=unk8, 24=unk9, 25=unk10, 26=unk11, 27=unk12 and 28=unk13. The main differences between terpene profiles of the evaluated strains belonging to the two principal biotypes were that ‘mostly indica’ strains were characterized by dominancy of β-myrcene, present in high relative contents, with limonene or α-pinene as second most abundant terpenoid, while ‘mostly sativa’ strains were characterized by more complex terpene profiles, with some strains having α-terpinolene or α-pinene as dominant terpenoid, and some strains having β-myrcene as dominant terpenoid with α-terpinolene or trans-β-ocimene as second most abundant terpenoid. This wide variability in terpene composition can provide a potential tool for the characterization of Cannabis biotypes, and warrant further researches in order to evaluate the drug’s medical value and, at the same time, to select less susceptible chemotypes to the attack of herbivores and diseases. More detailed studies on the variability in monoterpenes and sesquiterpenes are needed. Breeding for specific terpenoids in plants is a fascinating research topic; in fact, the various biological activities of these compounds make the analysis of terpenoids a valuable tool for improving a considerable number of traits in pharmaceutical and industrial cultivars of Cannabis. Terpenoids analysis, combined with cannabinoids and flavonoids analyses, are essential for the metabolic fingerprinting of pharmaceutical cultivars. Pharmaceutical cultivars of the two principal biotypes may exhibit distinctive medicinal properties due to significant differences in relative contents of terpenoids, thus the synergy between the various secondary metabolites must be investigated in deeper details in the future in order to better elucidate the phytocomplex of Cannabis and to allow selection of chemotypes with specific medical effects. Thanks to Phytoplant Research S.L. for financial assistance. Fischedick, J.T., Hazekamp, A., Erkelens, T., Choi, Y.H. and Verpoorte, R. 2010. Metabolic fingerprinting of Cannabis sativa L., cannabinoids and terpenoids for chemotaxonomic and drug standardization purposes. Phytochemistry 71:2058-2073. Hillig, K.W. 2005. Genetic evidence for speciation in Cannabis. Genetic Resources and Crop Evolution 52:161-180. Huang, M., Abel, C., Sohrabi, R., Petri, J., Haupt, I., Cosimano, J., Gershenzon, J. and Tholl, D. 2010. Variation of herbivore-induced volatile terpenes among Arabidopsis ecotypes depends on allelic differences and subcellular targeting of two terpene synthases, TPS02 and TPS031. Plant Physiology 153:1293-1310. McPartland, J.M. and Russo, E.B. 2001. Cannabis and Cannabis extracts: greater than the sum of their parts? Journal of Cannabis Therapeutics 1:103-132. Mediavilla, V. and Steinemann, S. 1997. Essential oil of Cannabis sativa L. strains. Journal of the International Hemp Association 4:80-82. Navia-Ginéa, W.G., Yuanb, J.S., Mauromoustakosd, A., Murphye, J.B., Chenb, F. and Kortha, K.L. 2009. Medicago truncatula (E)-β-ocimene synthase is induced by insect herbivory with corresponding increases in emission of volatile ocimene. Plant Physiology and Biochemistry 47:416-425. Nerio, L.S., Olivero-Verbel, J. and Stashenko, E. 2010. Repellent activity of essential oils: a review. Bioresource Technology 101:372-378. Novak, J., Zitterl-Eglseer, K., Deans, S.G. and Franz, C.M. 2001. Essential oils of different cultivars of Cannabis sativa L. and their antimicrobial activity. Flavour and Fragrance Journal 16:259-262. Paduch, R., Kandefer-Szerszeń, M., Trytek, M. and Fiedurek, J. 2007. Terpenes: substances useful in human healthcare. Archivum Immunologiae et Therapiae Experimentalis 55:315-327. Potter, D. 2009. The propagation, characterisation and optimisation of Cannabis sativa L. as a phytopharmaceutical. Ph.D. Thesis in Pharmaceutical Sciences. Department of Pharmaceutical Science Research, King’s College, London.